REPORTING FROM MASON, OHIO – Serena Williams just didn’t want to be here. So just before her match with Sam Stosur Wednesday, she withdrew from the Cincinnati Open with what she called a “bit of an aggravation’’ and “not feeling excellent’’ and “a little swelling’’ in her big toe. 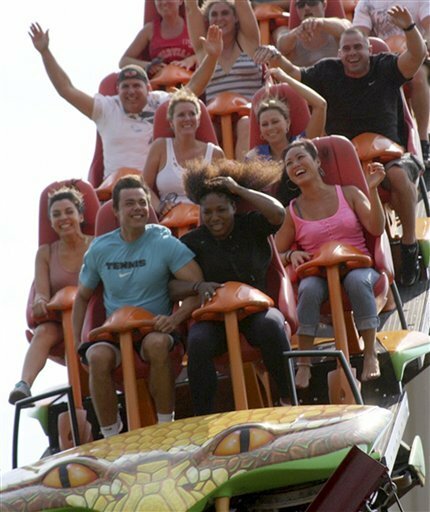 Later, pictures of her emerged on the web sitting in a roller coaster at the amusement park a few blocks from the tennis center. She also said she would likely make it to Kim Kardashian’s wedding Saturday. Williams just didn’t want to be here. Is she hurt? Sure she is. Everyone in tennis is. But Williams made a commitment to come here, and then showed up for one match – enough to avoid being fined for breaking her commitment – and then stuck it to the tournament, stuck it to the tour, stuck it to the ticket-buying fans. I don’t dance unless there’s music playing. That’s what Widdle Andy Woddick said to the chair umpire during his latest itty bitty temper tantrum Monday night in Cincinnati. He had blown the second set, broken his racquet and then, a little later, angrily drilled a ball into the stands. He didn’t think the chair umpire should have done anything, I guess, much less give him a point penalty, as the rules called for. From there, Roddick fell apart. Time spent on the court during play was sort of the filler for Roddick until he could get on with his main objective, which was to sit down during changeovers and argue some more. 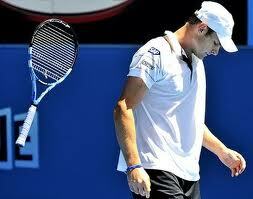 We’ve seen plenty of tantrums from Roddick before. He once spent endless time arguing with a line judge who had said he foot-faulted with his right foot. Actually, it had been his left, as if that mattered. Roddick gave up. He stopped running for balls. His comfort wasn’t in winning, but in whining. That was pretty stunning, as he took a 7-6, 4-2 lead over Phillip Kohlschreiber, and then lost 6-7, (7-5), 7-5, 6-1.